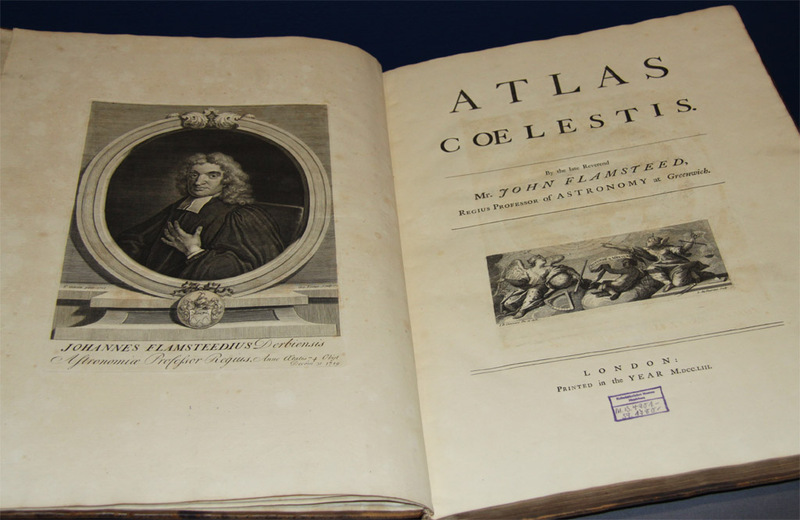 On Saturday 1st October 2011 a group of DDAS members were treated to a private viewing of a copy of John Flamsteed's Atlas Coelestis at the Derby Museum and Art Gallery. Sir John Flamsteed was England's first Astronomer Royal and was born in Denby, Derbyshire and attended Derby School. He eventually went to Jesus College in Cambridge but his knowledge of astronomy was gained through his own studies rather than any formal training. In 1675 he was invited by Charles II to be 'The King's Astronomical Observator'. A year later the Royal Observatory in Greenwich was founded and it was from there that Flamsteed compiled a catalogue of over 3000 star positions and magnitudes. 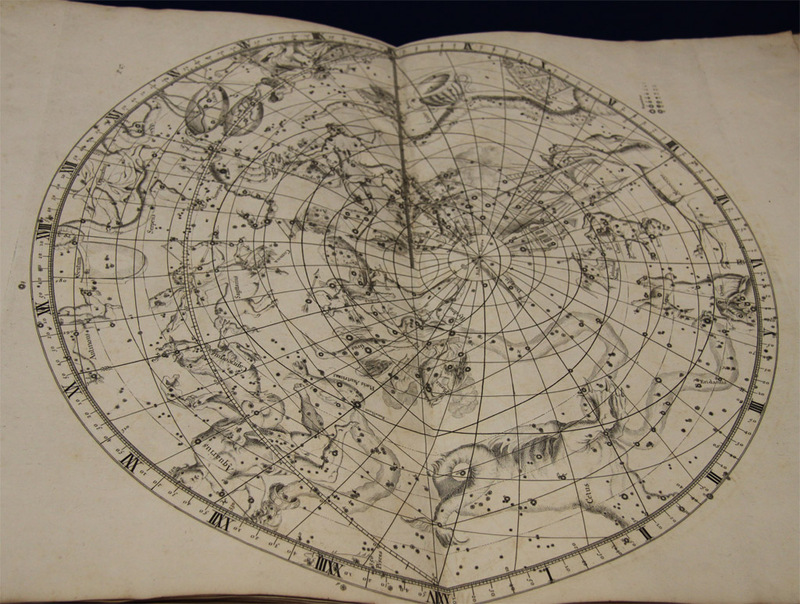 The Atlas Coelestis is based on this catalogue and was published posthumously in 1729. 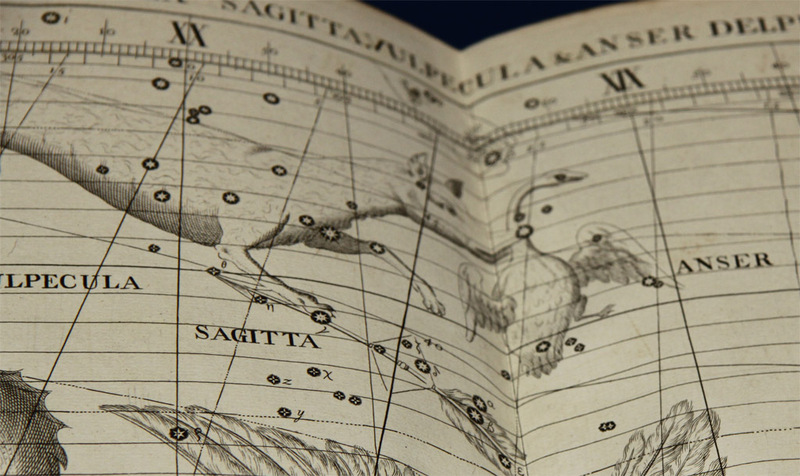 The Derby Museum holds a copy of the second edition of Atlas Coelestis, published in 1753. 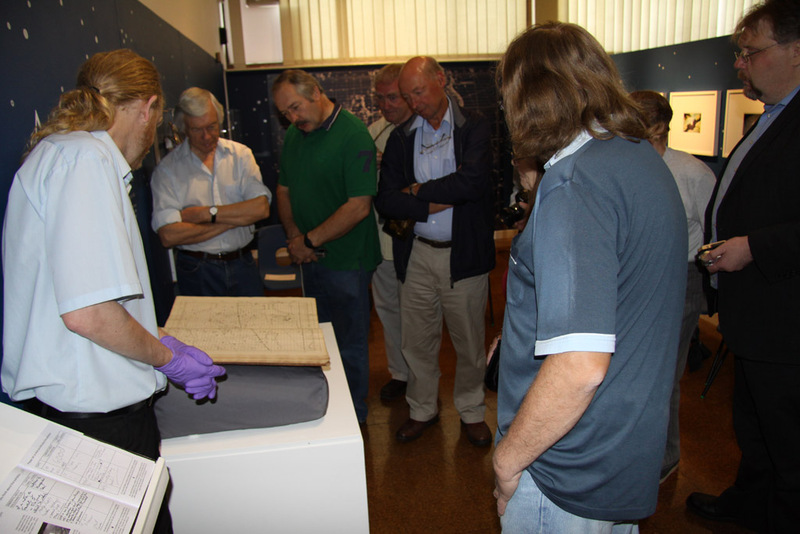 The DDAS was invited by Jane Hardstaff from Derby Museum and Art Gallery in recognition of our involvement in their 'Astronomical: The Beauty of a Thousand Stars' exhibition, which opened on 3rd September 2011. 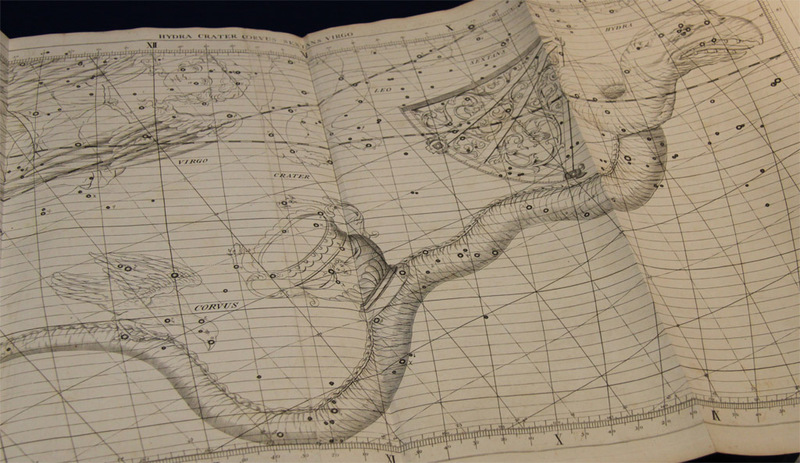 The Society provided information for a timeline of discoveries and developments in astronomy since the invention of the telescope and a short piece on Flamsteed, his work as the first Astronomer Royal at Greenwich and how his Atlas Coelestis came about. The exhibition also has some details on the DDAS, our meeting programme and a brief history of our own Flamsteed Observatory. It runs until April 2012. 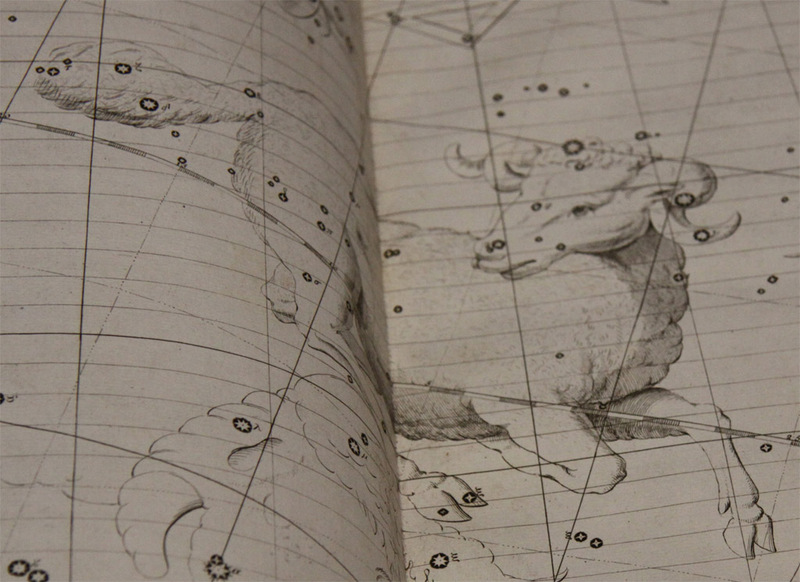 Here is a selection of some of the pages and constellations seen in the Atlas. Photographs taken by Mike Lancaster with kind permission of Derby Museum. 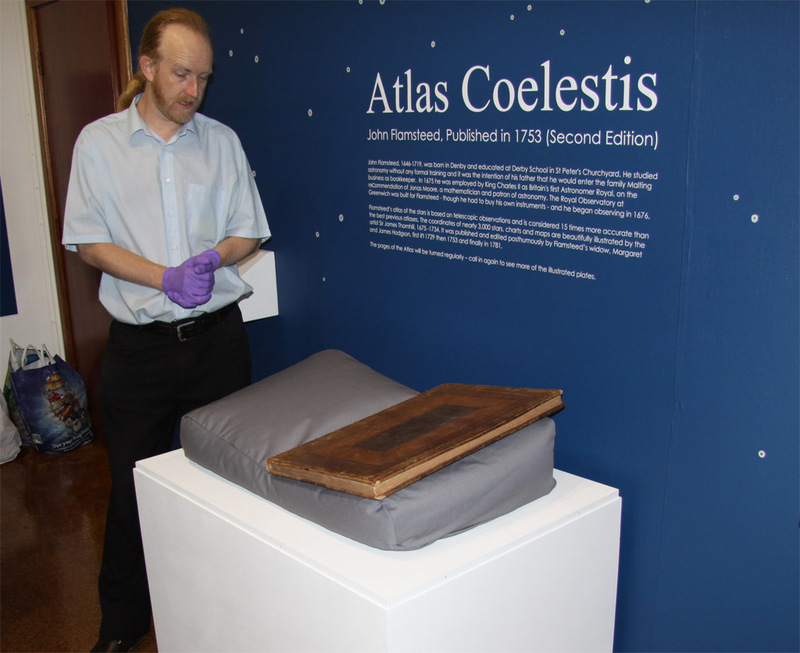 Derby Museum conservator Matt Edwards prepares to turn the pages of the Atlas for us. The title pages of the Atlas with a portrait of Johannes Flamsteedius Derbiensis. The dedication. 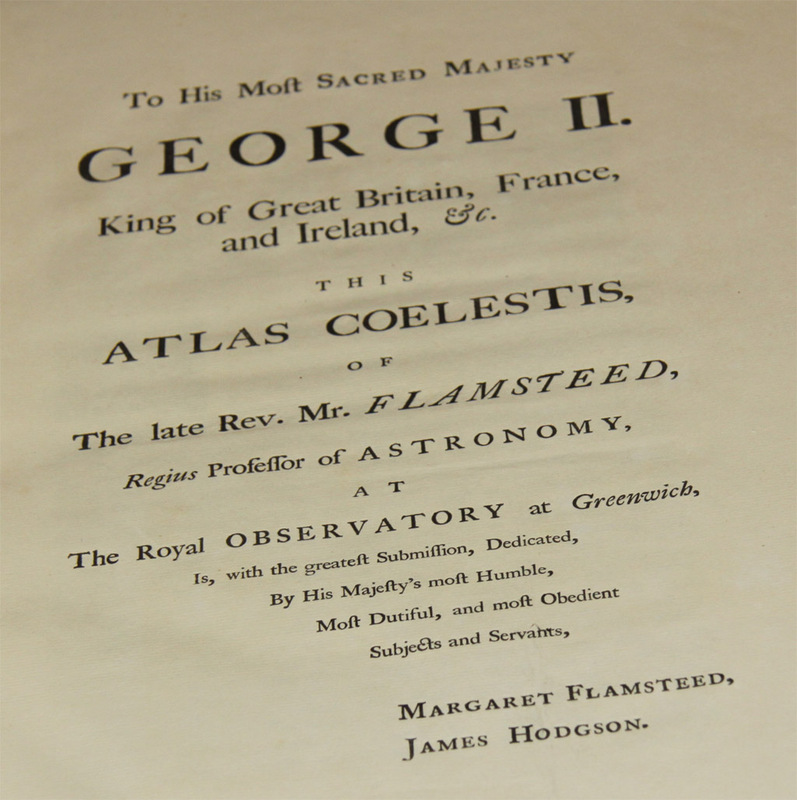 The Atlas was published posthumously by Flamsteed's widow Margaret and James Hodgson. Aries, the Ram. Interestingly this appears first in the Atlas, and as the Ram is a symbol of the city of Derby through the legend of the Derby Ram one wonders if this is not a coincidence? A more likely explanation is that this page of the Atlas contains the First Point of Aries (actually in Pisces), which defines the zero point for Right Ascension (the celestial equivalent of longitude). 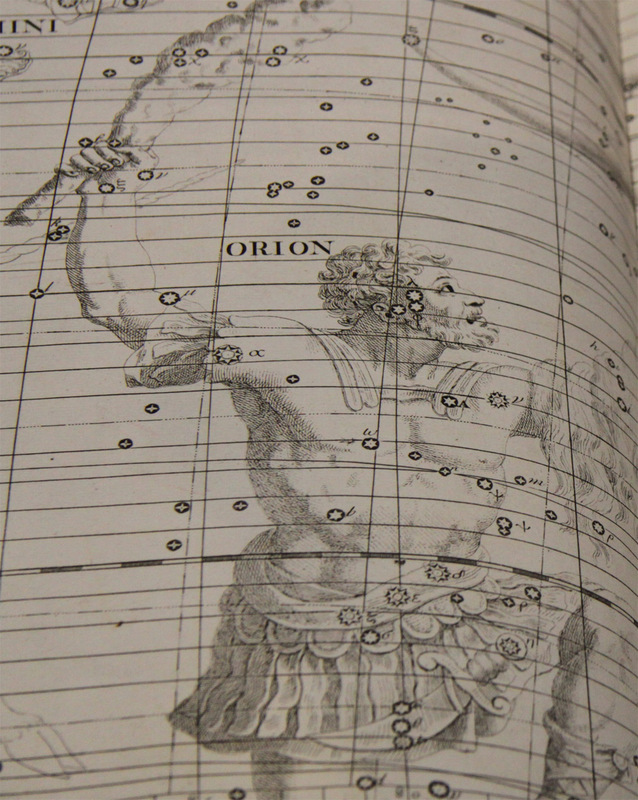 The Atlas contains a few 'obsolete' constellations which are no longer recognised by the world body of astronomy, the International Astronomical Union (IAU). The 88 modern and officially recognised constellations and their boundaries were ratified by the IAU in 1922. One such example of a former constellation is Antinous. This was created by the Roman Emperor Hadrian in 132 AD in memory of a beautiful youth who legend has it perished while saving Hadrian from drowning in the Nile. Antinous lies just below Aquila the Eagle, and is in fact being carried in the talons of the celestial bird. The stars that made up Antinous are now part of Aquila. Another obsolete constellation is Anser, The Goose. Here we can see that Vulpecula, The Fox, is carrying off Anser in its jaws. Today the stars of Anser are now part of Vulpecula but the brightest star in The Fox, Alpha Vulpeculae, has retained the name Anser. Note also the small constellation of Sagitta, the Arrow, whizzing by below Vulpecula. Canis Major, The Great Dog. Note the spelling of Sirius as Syrius. 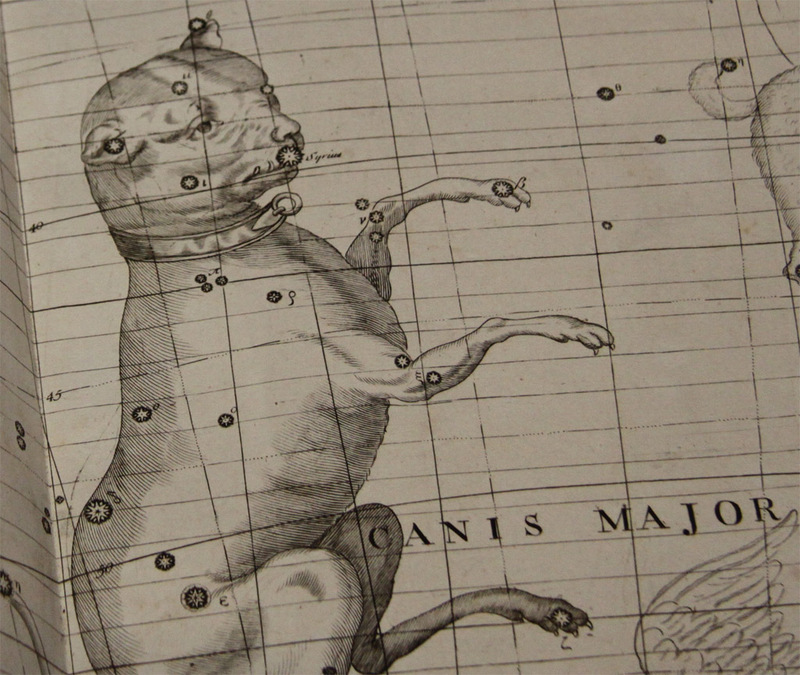 One wonders if the face of Canis Major seen here is actually a caricature of someone? 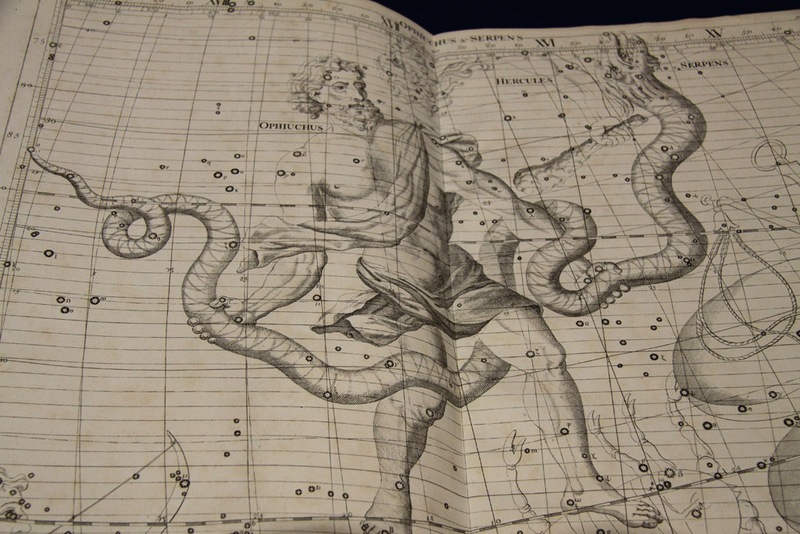 Hydra, The Sea Serpent, accompanied by Corvus, The Crow, Crater, The Cup and Sextans, The Sextant. 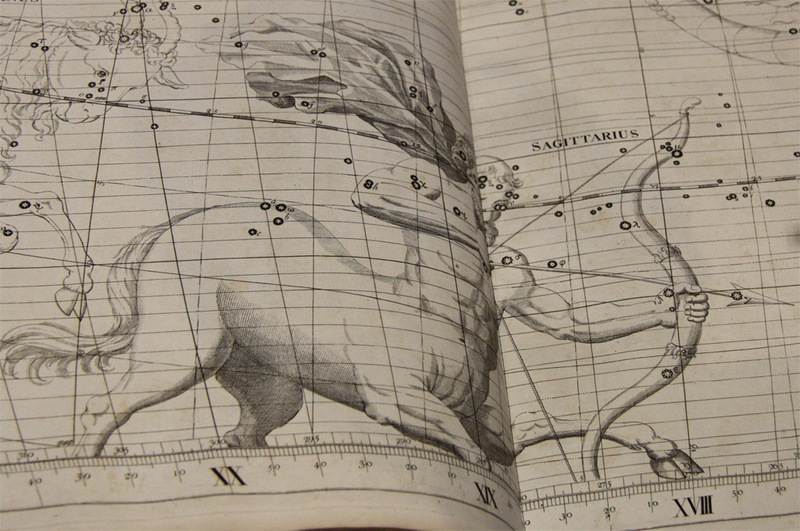 The familiar stars of The Plough are a little hard to make out in this depiction of Ursa Major, The Great Bear. Note the Hunting Dogs of Canes Venatici at the heel of Ursa Major. Ophiucus, The Serpent Bearer, carries Serpens, The Serpent in his arms. 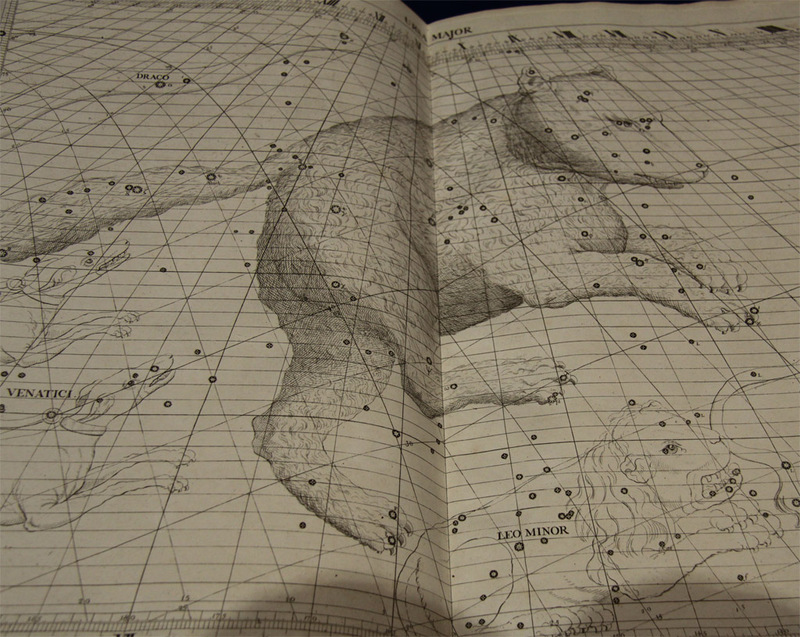 The last plate in the Atlas shows the constellations of the southern hemisphere. DDAS members view the Atlas. 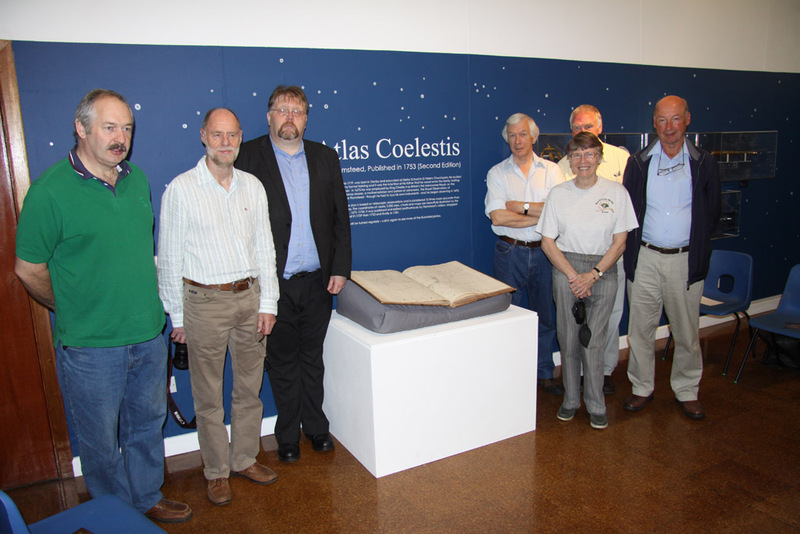 DDAS members with the Atlas Coelestis.